When I was a teen, I got it stuck in my head that I would go to college in Boston. I'm not exactly sure why — before applying for colleges, I'd visited Boston exactly once during my freshman year in high school for a Model UN trip (I'm a nerd, I know). Although I spent the majority of my time there in a stuffy lecture hall at Harvard, I guess the city must have left enough of an impression of me to want to spend the next four years there. So I applied to a bunch of colleges in the city, and while I got into a handful, none of them were really my first choice. One of those colleges was Wellesley College, an all women's liberal arts college. Although Wellesley is a wonderful school (it's where some of my feminist heroes like Hillary Clinton and Madeleine Albright graduated from), I wasn't sure I was ready to spend the next four years in an estrogenfest (I know, I know — I'm sure I'm going to get some angry women's college grads emailing me about how this isn't the case at all, but keep in mind that this was pre-Tinder and I was 17 when I was making these decisions). And, if I'm being completely honest, the gender thing was actually a secondary concern. I was more alarmed by a campus legend that told the story of Wellesley's (male) founder, Henry Durant, declaring that, "pies, lies, and donuts should never have a place in Wellesley College." Aside from the obvious angry/exhausted feminist POV ("Why is some dude telling a bunch of women what not to eat? "), I worried that the school cafeteria might secretly put all its students on a secret, insidious diet without our consent (though this is obviously not the case — what can I say, I was a weird/neurotic 17-year-old, in case you couldn't already tell from the Model UN participation). Anyway, this campus legend apparently has some basis in fact because Wellesley women apparently defied this Henry Durant dude and spent some time underground baking in their dorms to develop this Wellesley Fudge Cake. Wellesley Fudge Cake is a chocolate buttermilk defined by its square shape and chocolate fudge frosting. It's absolutely delicious. 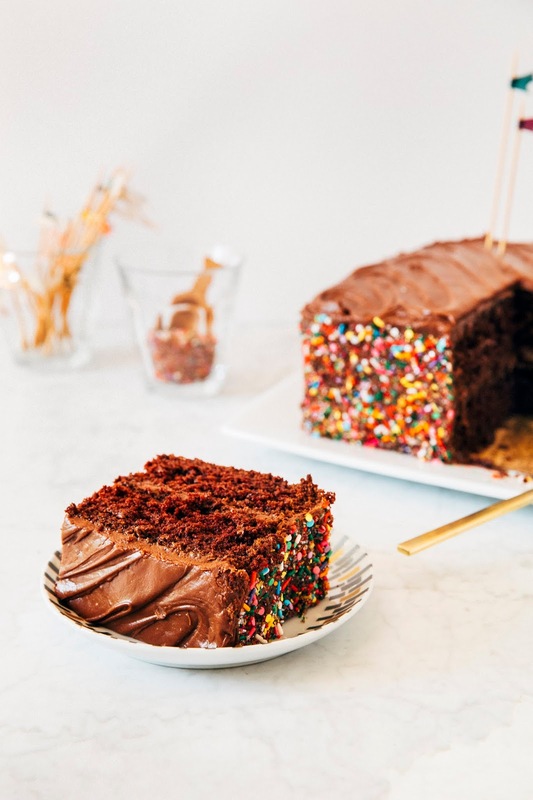 Because the original recipe was apparently pretty labor intensive, the crazy talented America's Test Kitchen family updated the recipe in 2010 in a Cook's Country issue and modernized the cake to include more chocolate flavor and a silkier frosting. They did such a good job that Wellesley College itself uses a variation of their recipe in their own kitchens! This recipe is included in America's Test Kitchen's new(ish) book, The Perfect Cake, a cookbook dedicated to all things cake. 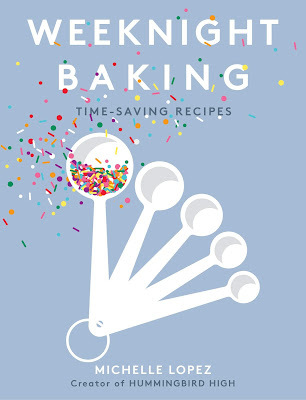 The book features a host of cake recipes, ranging from the modern favorites today (they have a gluten-free funfetti cake, y'all!) to classics like this Wellesley one. Enjoy! 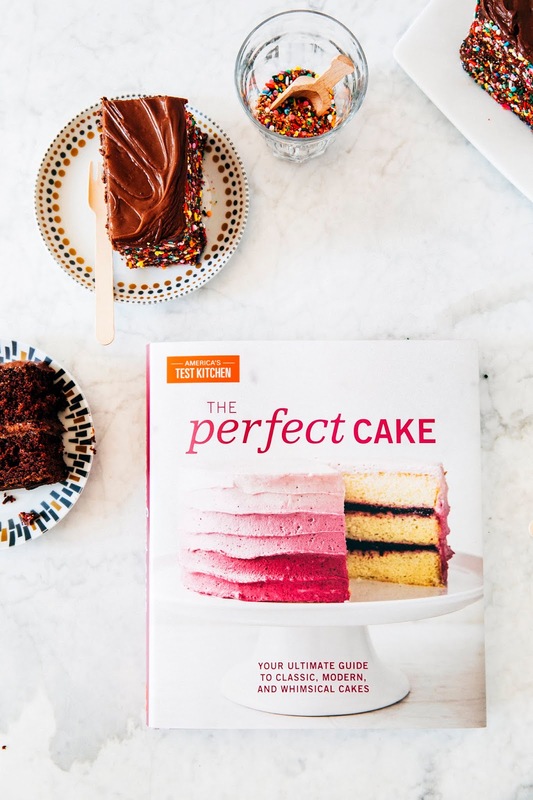 A big thank you to America's Test Kitchen for sending me a copy of The Perfect Cake! 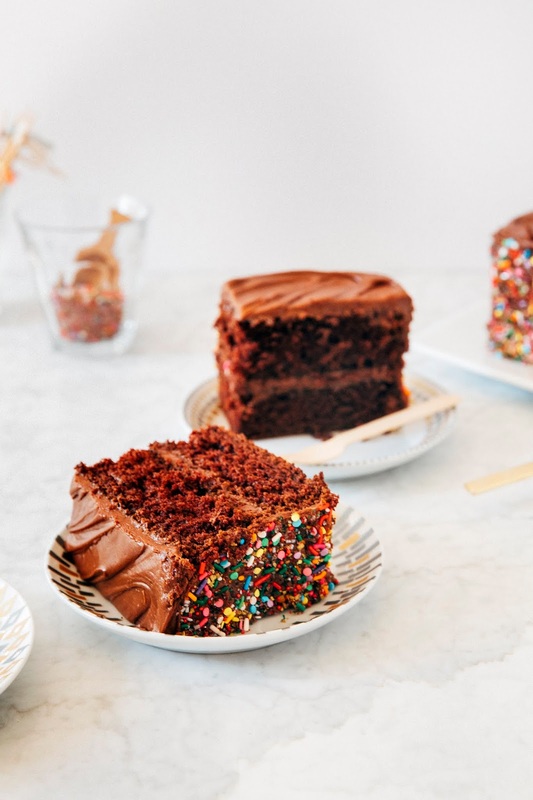 This chocolate frosting is distinct from other frostings since it's technically a fudge candy frosting — this means that you'll need to cook some of the ingredients to create a fudge toffee situation, before stirring in chocolate and sugar to make it into a frosting. The recipe yields a frosting that is harder than traditional buttercream recipes, but with the fudge and silkiness of old school fudge candy. To make the very best frosting, be sure to sift the confectioners' sugar‚ if you don't do so beforehand (like I did the first time around, because I hate sifting), the frosting will come out a lumpy. It also helps if you stir in the confectioners' sugar when the chocolate mixture is still hot. Also, let me warn you that the fudge frosting will harden if not used fast enough; be sure to frost the cake within 10 to 15 minutes of making the frosting. 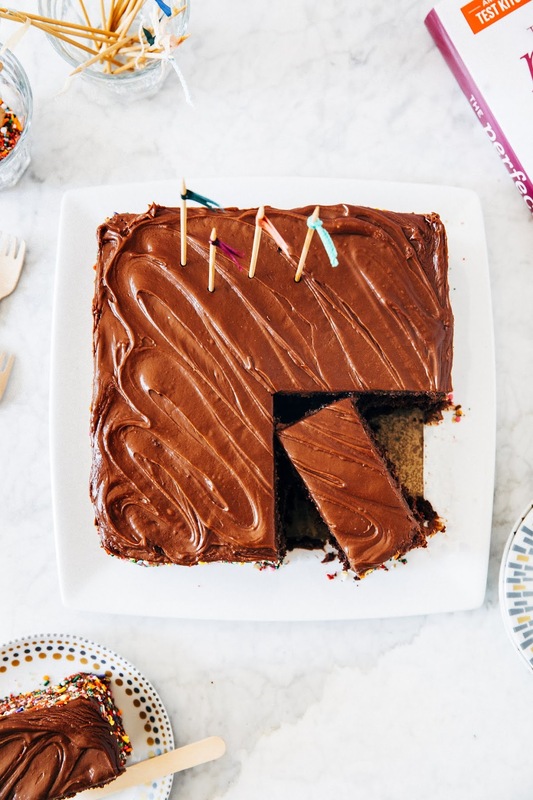 And finally, the recipe makes a lot of frosting — don't be afraid to use a lot in the middle of the cake! Center a rack in the oven and preheat to 350 (F). Grease two 8-inch square cake pans, line with parchment paper, grease parchment, and flour pans. Whisk 2 1/2 cups all-purpose flour, 2 teaspoons baking soda, 1 teaspoon baking powder, and 1/2 teaspoon kosher salt together in a medium bowl. Whisk 3/4 cup hot water and 1/2 cup unsweetened natural cocoa powder in a small bowl until smooth; set aside. Using a freestanding electric mixer fitted with a paddle attachment, beat 1 cup unsalted butter and 2 cups granulated sugar on medium-high speed until pale and fluffy, about 3 minutes. Add 2 large eggs, one at a time, and beat until combined. Reduce speed to low and add flour mixture in 3 additions, alternating with 1 cup buttermilk in 2 additions, scraping down the bowl as needed. Slowly add the cocoa mixture and 2 teaspoons pure vanilla extract and mix until incorporated. Use a rubber spatula to scrape down the paddle and sides of the bowl and mix any residual ingredients into the batter by hand. Divide batter evenly between prepared pans and smooth tops with a rubber spatula. Bake until a toothpick inserted into the center of each cake comes out with few crumbs attached, 35 to 40 minutes. Let cakes cool in pans on a wire rack for 15 minutes. 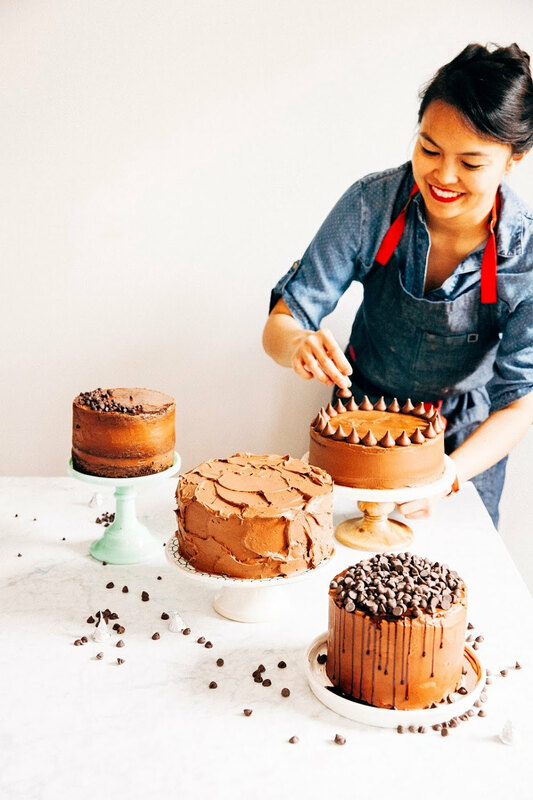 Remove cakes from pans, discarding parchment, and let cool completely on rack before frosting. Heat 1 1/2 cups brown sugar, 1/2 cup evaporated milk, 4 tablespoons unsalted butter, and salt in a large saucepan over medium heat until small bubbles appear around perimeter of the pan, around 4 to 8 minutes. Reduce heat to low and simmer, stirring occasionally, until large bubbles form and the mixture has thickened and turned deep golden brown, about 6 minutes; transfer to a large bowl. Stir in remaining 1/2 cup evaporated milk and remaining 4 tablespoons unsalted butter until mixture is slightly cool. Add 8 ounces chocolate and 1 teaspoon vanilla extract and stir until smooth. Whisk in 3 cups confectioners' sugar until incorporated. Let cool for 15 to 20 minutes, stirring occasionally. 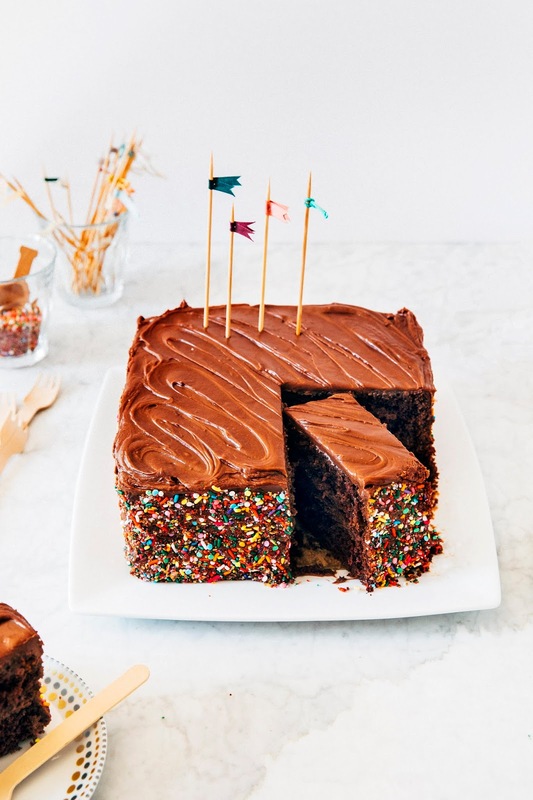 Line edges of the cake platter of your choice with 4 strips of parchment paper to keep the platter clean. Place 1 cake layer on the platter. Spread 1 cup frosting evenly over the top of the cake, right to the edge of the cake. Top with second cake layer, pressing lightly to adhere, then spread remaining frosting evenly over the top and sides of the cake. Refrigerate the cake until frosting is set, about 1 hour. Carefully remove parchment strips before serving.